Join the original pioneer girl in this Little House chapter book, adapted for younger readers from Laura Ingalls Wilder’s beloved classics. Illustrated with beautiful new black-and-white artwork, this repackaged edition includes bonus material such as games, activities, and more! For Laura Ingalls, Christmas means good things to eat, visits from friends, and special gifts to give and receive. As Laura grows up, every Christmas is better than the one before. Gentle adaptations of Laura Ingalls Wilder’s celebrated Little House stories have been gathered together here in two new titles in our Little House Chapter Book series. 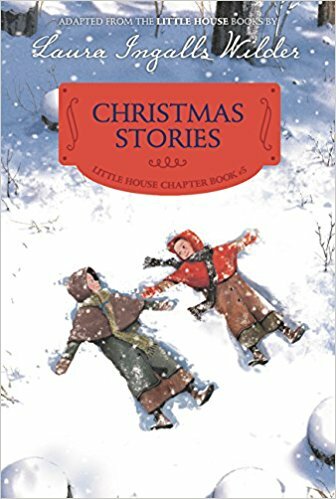 In Christmas Stories, join Laura and her family for some pioneer Christmas celebrations. Christmas on the frontier means visits from friends, good things to eat, and presents! For Laura, every Christmas in the little house is better than the one before. Laura and her friends share wonderful adventures in Little House Friends. From racing ponies with cousin Lena to bobsled rides with Cap Garland and the gang, Laura loves spending time with her friends. Even mean old Nellie Oleson can’t spoil Laura’s fun!With simple text, entertaining stories, and Renee Graef’s beautiful black-and-white artwork, Little House Chapter Books are the perfect way to introduce beginning chapter-book readers to the world of Little House. About the Author: Laura Ingalls Wilder was born in the Wisconsin woods in 1867. She wrote the Little House books based on her own experiences growing up on the Western frontier. Just like the characters in her stories, Laura and her family traveled by covered wagon across the Midwest and experienced many of the same adventures. She finally settled down in Mansfield, Missouri with her husband, Almanzo, where she lived until her death in 1957.